There was a period of time when every December I’d start up another playthrough of Mega Man Legends. It’s not a Christmas-y game by any stretch. And it’s not something I originally got as a present either. For whatever reason it just seemed to fit, helping me take a step back and appreciate the end of the year by exploring a tiny island full of violent robots. 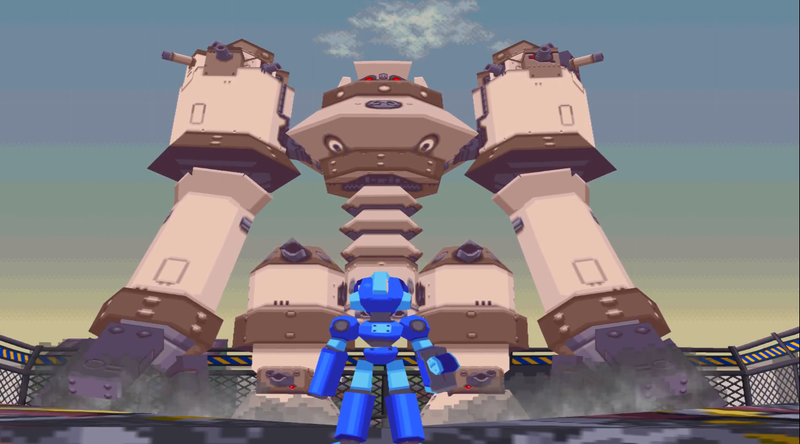 While Mega Man Legends, Capcom’s 3D sandbox approach to the series during the PS1 era, is a wonderfully balanced and imaginative game, there’s a portion toward the end that’s always stuck with me more than all the rest of it. Specifically, there’s a part of Kattelox Island called Old City that I’d return to near the end of the every December to take in its grayish solitude. Old City is the island’s mostly abandoned industrial sector, full of muted buildings and large warehouses. It’s the kind of place you can go in a game to hear yourself think, with no real objectives or enemies in place. Imagine the rooftop hopping scene from Mary Poppins but rendered in a few polygons and with a little blue android. There is one thing that happens in Old City though. Prior to the final events of the game, you can venture into one if its larger buildings by using a secret underground tunnel. Once inside, you discover Teisel, Tron, and Bob Bonne, a family of space pirates you’ve thwarted for most of the game, working on a giant robot to try and destroy you once and for all. It’s enormous, and if you run along the alleys toward the other side of the map, still easy to spot from a distance. It can also blow up buildings, leaving a trail of destruction in its wake as it meanders about the neighborhood. It’s not a particularly difficult fight, but that’s almost beside the point. Rather than a frenetic onslaught, the pace of the encounter is plodding, almost meditative. It’s one of the few boss fights I’ve come across in a game that gives you time to sit, watch, and reflect. Something in the way the game allows the action at that point to naturally fade into the background, while remaining present and dynamic, helps you take in every little detail. At least until the monstrosity destroys every building an leaves you no choice but to face it. The first time I played through that portion I was mesmerized. It felt transcendent. And I supposed going back to it so many times, especially around this time of year, was partly an attempt to experience that epiphany anew. It was also, I think, partly a way of making the holiday itself more special, in the way any ritual tries to, imbuing the new experience with meaning by retracing the outlines of the old one. Of course, Mega Man Legends isn’t the only game that I’ve been known to pick back up around Christmas. There’s also Donkey Kong Country, Ocarina of Time, and Final Fantasy XII, games I got as presents one year or another and which thereby branded themselves into my memory as distinctly seasonal affairs. The video game wrapped and sitting under the tree to be revealed, played, and celebrated Christmas morning has become pervasive to the point of being a cliche. If you’re reading Kotaku, odds are you remember at least one year where you got the console or game of your dreams (or both as I did when Santa graced me with a Game Boy Color and Pokemon Yellow). But while the broad contours of the stories are similar form one person to the next, everyone has a unique story surrounding the game they got and why it felt so special. If you’ve managed to take your eyes of Jeff Kaplan for a few minutes then, pour yourself another eggnog and tell us about your favorite holiday games and what they mean to you.